Peyton and I love trying out new products together and recently she has really been taking a liking to “spa days” at home. Well luck would have it I came across an opportunity to try out a Dead Sea Mud Mask made by Pure Essentials in exchange for an honest and unbiased review. Of course I agreed. The thought of Peyton’s face when I tell her I am going to smear mud on her face made me giggle. So the mud mask arrived. When I opened the jar I noticed right away it was soft, pliable mud. Using a brush would give you the perfect application. But since I was going for fun we used our fingers! Pure Essentials is also an animal cruelty free company. No testing is being done on our furry animal friends! And this 100% natural and organic. 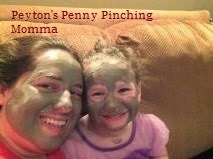 After dinner I told Peyton we were going to smear mud on our faces. Her response was priceless! She thought I was teasing until I brought out the mask. At first she was hesitant but after I started applying it to my face she wanted to try it out. We both had our masks on within a minute. It’s very important to get a nice layer on your face. Thick enough so you can receive the benefits of the mask but thin enough that it will dry in 10 minutes. Our 10 minutes passed fairly quickly. Peyton took the time to run around the house and terrorize our dogs by jumping out and yelling boo. And I took the time to do the dishes. I’m thinking she had more fun. Once our timer went off we returned to the bathroom and used warm water to remove our mud. Instantly I could feel a difference. My skin felt clean and refreshed. Peyton said she felt energized. It was a nice experience and we both had a great time trying out the mask. When I did the mask I had a few pimples around my chin and hair line. By the next day I could already tell they were shrinking in size. The inflammation from them had reduced considerably. I attribute this to the Dead Sea Mud Mask and the 21 essential minerals that help nourish your skin. I received Pure Essentials Dead Sea Mud Mask complimentary for evaluation purposes. Regardless, all opinions expressed are still 100% my own. I am disclosing this in accordance with Federal Trade Commission 16 CFR, Part 255 Guides Concerning the Use of Endorsement and Testimonials in Advertising.